Juano Hernandez was born Juan G. Hernandez in San Juan, Puerto Rico to a Puerto Rican seaman and African American mother. The self-educated, multifaceted, actor spent most of his childhood in Brazil singing and performing acrobatics before moving to the Caribbean Islands where he became a professional boxer. After his boxing career ended, Hernandez became a singer in a minstrel show and then had a brief career as a circus and vaudeville performer. He moved to the United States in the 1920s where he worked as a script writer and radio actor. In 1927, he made his Broadway debut in the stage production of Show Boat, followed by roles in Strange Fruit and Set My People Free. By the early 1930s, Hernandez embarked on his film career, appearing in independent black filmmaker Oscar Micheaux’s race movies The Girl from Chicago (1932), Lying Lips (1939), and The Notorious Elinor Lee (1939). In 1942, he became one of the first black actors to be cast in the radio soap opera We Live and Learn, which CBS later transposed into an all-black soap opera called The Story of Ruby Valentine. 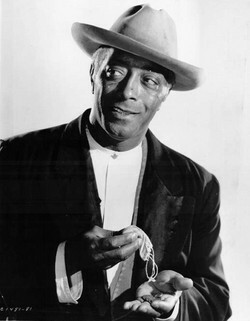 In 1949, Hernandez accepted the Hollywood film role of Lucas Beauchamp in William Faulkner’s Intruder in the Dust, becoming one of the first black actors to obtain a leading role parallel to his white counterparts. In Intruder in the Dust, Hernandez represents a dignified black man falsely accused of murdering a white Southerner. Hernandez’s performance earned him critical acclaim, two foreign film awards, and 30 additional film roles in which he was nearly always presented as a compelling, invigorating character. During the 1950s, at the height of his career, he appeared in films such as Young Man with a Horn (1950) opposite Kirk Douglas, and The Trial (1955). In 1958 his character was the minister and patriarch of W.C. Handy in the 1958 film St. Louis Blues, starring Nat King Cole (as W.C. Handy), Pearl Bailey, Ruby Dee, and Eartha Kitt. Hernandez continued to regularly appear in films throughout the 1960s. Although he never again obtained starring roles, Hernandez continued to act until the time of his death. Juano Hernandez died in a suburban New York City clinic of a stroke in 1970, at the age of 74. His last film, They Call Me MISTER Tibbs, which starred Sidney Poitier, was released the same year. Donald Bogle, Blacks in Film & Television: An Encyclopedia (New York: Garland, 1988); Donald Bogle, Dorothy Dandridge: A Biography (New York: Amistad Press, 1997); Alan Pomerance, Repeal of the Blues (Secaucus, NJ: Citadel Press, 1988); "Juan Hernandez, Actor, Dies at 74," New York Times, July 19, 1970. York Times, July 19, 1970.